Carmel Dental Associates provides dental bridges in Carmel, NY. Call 845-225-2224 to learn more and schedule your appointment. The American Dental Association (ADA) reports that the average adult has three missing or heavily decayed teeth. A dental bridge is a common way to restore a row of adjacent missing teeth. The most common type of dental bridge, this relies on healthy existing teeth on either side of the row of missing teeth. The bridge consists of pontics, or synthetic teeth, connected to a crown at each end. The crowns are cemented onto the healthy teeth, acting as abutments to support the bridge. A cantilever bridge is anchored only on one end. It can be useful in some circumstances, but has a higher risk of failure than a traditional bridge due to the additional stress that is placed on the supporting healthy tooth. Since a traditional or cantilevered bridge can weaken the healthy teeth that support it, implant supported bridges have become quite popular. They also work well when there are not healthy teeth at both ends to support a traditional bridge. Rather than natural teeth, the bridge is supported by dental implants at one or both ends. A Maryland Bridge is supported by a metal frame cemented to the backs of the existing teeth. It preserves tooth structure in the healthy teeth due to the lack of crowns, but is not as strong as a traditional bridge. Your dentist will carefully evaluate your teeth and help you decide which restoration is best for you. 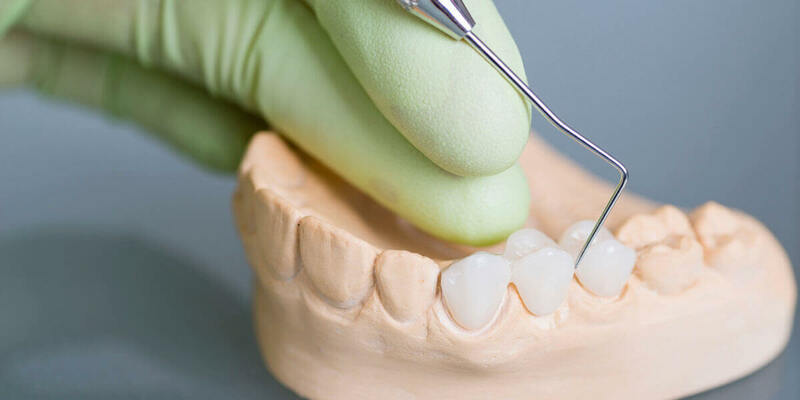 If you suspect that you need a dental bridge or other restoration, please call Carmel Dental Associates at (845) 225-2224 to schedule an evaluation.